Yesterday Sam and LeAnne asked what type of cross training (XT) I’ll be doing during my spring 5K racing season. I’ll be keeping up with my usual cross training activities, which I realize I hardly ever blog about! I’m going to try to be more diligent about sharing my workouts. I’m writing up a post about all of the activities I like doing and I think I’ll have it ready for tomorrow. I’m sure you’re waiting at the edge of your seat ;). This week and next I’m in a “reset” training period where my running will be easy and mileage will be low so it’s the perfect time for me to talk about XT! On Monday I did a mini upper body workout followed by Lauren’s 10 Minute Plank Workout. I usually put a little more oomph into this workout and add a few other moves, but I had a killer sinus headache and just wanted to wrap it up. I’ve just recently ventured into different types of planks. Up until a couple of weeks ago the only type I had ever done was the forearm plank. What I’ve learned recently is that side planks are hard and humbling! I repeated that formula twice, adding on a little extra time to the push-up plank and superman since I subtracted time from the side planks. If you give this plank workout a try I can promise you’ll be feeling the burn! Yesterday I woke up with sore legs and a sore core thanks to the race and those planks! I really wanted to shake out my legs, so I headed down to the beach and did four easy miles. I felt so much better by the end of the run! I hope you had a great run yesterday too! What type of cross training do you like to do most? How long can you hold a side plank?! Next Post I don’t own a sweater. Send help! I actually find side planks to be a little easier that front planks but I usually don’t try to hold them for as long. The real challenge for me is lifting my top leg while I do side planks! But I like that sequence and may have to give it a try this week! I think I know what you mean. Getting my top leg up and staying balanced is really the tough part about side planks! I can hold a side plank for about 45 seconds, but it has been a while, so now it is probably less! I am terrible at cross training–I do it, then I run anyway because I feel like I “missed” a workout. Haha I know what you mean! I try to do XT three times per week which means I run on two of those days. I really want to try and split those workouts up, where I do an easy run in the morning and then cross train in the evenings… but that would mean getting up earlier which is a tough one for me ;). I’m looking forward to reading about your cross-training. Its something that I could really improve on, so hearing about others’ successful efforts is always inspiring. I actually like planks, as far as core workouts go, so I’m definitely going to try this sequence out. Usually side planks are a little easier for me, but I’m like you, my right side is stronger/easier than my left. That’s so interesting that both you and Lisa find side planks easier. I think what throws me off on side planks is my poor balance. If I work on that a bit more I think I could hold the side planks longer! I already all of these besides the push up plank. I like the idea of adding it in before superman and building up to a 10 minute routine. My side planks are my weak area for now, definitely need to work on them. I’m right there with ya! I need to start incorporating more balance type stuff into my cross training. I never realized how poor my balance was until I started doing side planks! I’ve been dealing with a knee injury and when my issues first started, my ortho really stressed cross training to me. I love cycling and had been trying to get back into running, but I honestly have been horrible about getting in any other kind of exercise. If my knee ever gets better, I’m definitely going to start incorporating strength training into my exercise regimen. My understanding is that a lot of knee issues stem from decreased muscle strength in the quad and upper leg muscles. I also want to incorporate swimming into my routine since that’s such a great non-impact cardio exercise! You should talk to Meg from meggorun.blogspot.com and/or check out her blog. She was dealing with knee issues last year and she is a personal trainer so she has tons of good, sound advice on cross training around a knee injury! First of all – I love your blog!! You are a huge inspiration! I’ve just recently started working on planks…I can only get about 30 seconds in a forearm one and about 15 seconds on the side ones – so I’m going to keep working on that because I know that my core is too weak! My cross training (especially right now) is stationary bike, the sitting elliptical, strength training & PiYo. I hope that your foot injury heals up soon so you can enjoy some nice summer running! I definitely do not plank (or cross-train) enough! I need to incorporate more though. I look forward to hearing more about your XT activities so I can snag some of your ideas! I tend to find myself doing the same things over and over again. Kim from Day with KT always has great XT ideas though. I always find new things to try on her blog! I haven’t done side planks in awhile! My favorite cross training I guess would be Zumba. 🙂 I don’t really count lifting as cross training cause that’s my TRAINING hehe. I used to go to Zumba a lot but ever since my knee has been wonky (like a year!!!) I haven’t. Can’t wait to get back at it. I’ve been weight lifting longer than I’ve been running so it’s very hard for me to think of it as cross training! I am not surprised zumba is your favorite since you are such an awesome dancer!! 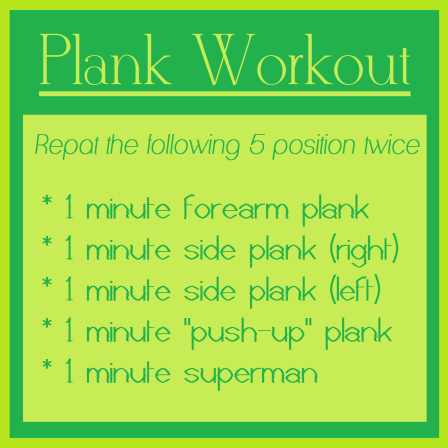 That plank workout sounds great! It’s a good one! I was sweating and shaking half way through! Holy cow, those are SERIOUS planks! I just bookmarked that page, thank you! 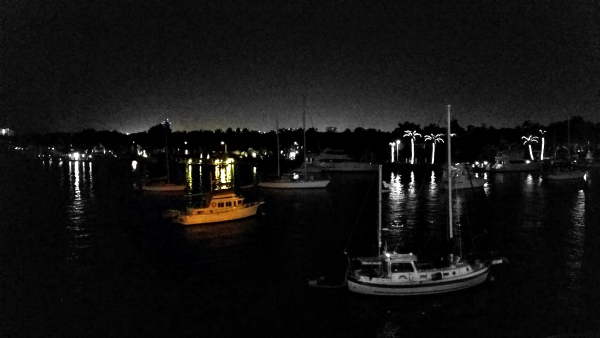 I love that picture of the boats at night!!! I like all kinds of cross training (except swimming:). Not sure the last time I timed a side-plank – I will have to try that soon – gotta get through this week of running first (it’s about to do me in!!). Kim, I bet you can hold a side plank for like 25 minutes! Your mileage is so high right now, but you’re going to be so well prepared for your race! I’m really excited for you! Side planks tend to hurt my shoulders if I do them too much but if I am motivated I’ll hold for a minute.